The Battle of Princeton (January 3, 1777) was a battle in which General George Washington’s revolutionary forces defeated British forces near Princeton, New Jersey. On the night of January 2, 1777 George Washington, Commander-in-Chief of the Continental Army, repulsed a British attack at the Battle of the Assunpink Creek in Trenton. That night, he evacuated his position, circled around General Lord Cornwallis’ army, and went to attack the British garrison at Princeton. Brigadier General Hugh Mercer of the Continental Army, clashed with two regiments under the command of Lieutenant Colonel Charles Mawhood of the British Army. Mercer and his troops were overrun and Washington sent some militia under Brigadier General John Cadwalader to help him. The militia, on seeing the flight of Mercer’s men, also began to flee. Washington rode up with reinforcements and rallied the fleeing militia. He then led the attack on Mawhood’s troops, driving them back. 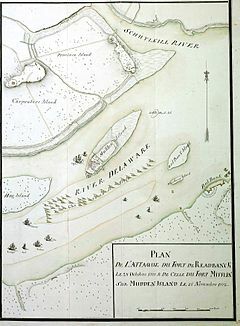 Mawhood gave the order to retreat and most of the troops tried to flee to Cornwallis in Trenton. In Princeton itself, Brigadier General John Sullivan encouraged some British troops who had taken refuge in Nassau Hall to surrender, ending the battle. After the battle, Washington moved his army to Morristown, and with their third defeat in 10 days, the British evacuated southern New Jersey. With the victory at Princeton, morale rose in the ranks and more men began to enlist in the army. The battle (while considered minor by British standards) was the last major action of Washington’s winter New Jersey campaign. The site of the battle is now Princeton Battlefield State Park. On the night of December 25–26, 1776 General George Washington, Commander-in-chief of the Continental Army, led 2,400 men across the Delaware River. After a nine mile march, they seized the town of Trenton on the morning of the 26th, killing or wounding over 100 Hessians and capturing 900 more. Soon after capturing the town, Washington led the army back across the Delaware into Pennsylvania. On the 29th, Washington once again led the army across the river, and established a defensive position at Trenton. On the 31st, Washington appealed to his men, whose enlistments expired at the end of the year, “Stay for just six more weeks for an extra bounty of ten dollars.” His appeal worked, and most of the men agreed to stay. Also, that day, Washington learned that Congress had voted to give him wide-ranging powers for six months that are often described as dictatorial. In response to the loss at Trenton, General Lord Cornwallis left New York City and reassembled a British force of more than 9,000 at Princeton to oppose Washington. 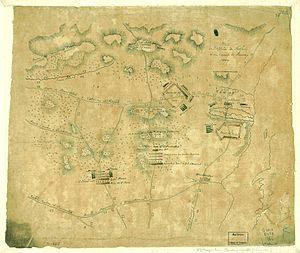 Leaving 1,200 men under the command of Lieutenant Colonel Charles Mawhood at Princeton, Cornwallis left Princeton on January 2 in command of 8,000 men to attack Washington’s army of 6,000 troops. Washington sent troops to skirmish with the approaching British to delay their advance. It was almost nightfall by the time the British reached Trenton. After three failed attempts to cross the bridge over the Assunpink Creek, beyond which were the primary American defenses, Cornwallis called off the attack until the next day. During the night, Washington called a council of war and asked his officers whether they should stand and fight, attempt to cross the river somewhere, or take the backroads to attack Princeton. Although the idea had already occurred to Washington, he learned from Arthur St. Clair and John Cadwalader that his plan to attack Princeton was indeed possible. Two intelligence collection efforts, both of which came to fruition at the end of December 1776, supported such a surprise attack. After consulting with his officers, they agreed that the best option was to attack Princeton. Washington ordered that the excess baggage be taken to Burlington where it could be sent to Pennsylvania. The ground had frozen, making it possible to move the artillery without it sinking into the ground. By midnight, the plan was complete, with the baggage on its way to Burlington and the guns wrapped in heavy cloth to stifle noise and prevent the British from learning of the evacuation. Washington left 500 men behind with two cannon to patrol, keep the fires burning, and to work with picks and shovels to make the British think that they were digging in. Before dawn, these men were to join up with the main army. By 2:00 AM the entire army was in motion and the men were ordered to march with absolute silence. Along the way, a rumor was spread that they were surrounded and some frightened militiamen fled for Philadelphia. The march was difficult, as some of the route ran through thick woods and it was icy, causing horses to slip, and men to break through ice on ponds. As dawn came, the army approached a stream called Stony Brook. The road the army took followed Stony Brook for a mile farther until it intersected the Post Road from Trenton to Princeton. However, off to the right of this road, there was an unused road which crossed the farmland of Thomas Clark. The road was not visible from the Post Road, and ran through cleared land to a stretch from which the town could be entered at any point because the British had left it undefended. However, Washington was running behind schedule as he had planned to attack and capture the British outposts before dawn and capture the garrison shortly afterward. By the time dawn broke he was still two miles from the town. Washington sent 350 men under the command of Hugh Mercer to destroy the bridge over Stony Creek in order to delay Cornwallis’ army when he found out that Washington had escaped. Shortly before 8:00 AM, Washington wheeled the rest of the army to the right down the unused road. First in the column went General John Sullivan’s division consisting of Arthur St. Clair’s and Isaac Sherman’s brigades. Following them were John Cadwalader’s brigade and then Daniel Hitchcock’s. Cornwallis had sent orders to Mawhood to bring the 17th and 55th British regiments to join his army in the morning. Mawhood had moved out from Princeton to fulfill these orders when his troops climbed the hill south of Stony Brook and sighted the main American army. Unable to figure out the size of the American army due to the wooded hills, he sent a rider to warn the 40th British Regiment which he had left in Princeton, then wheeled the 17th and 55th Regiments around and headed back to Princeton. That day, Mawhood had called off the patrol which was to reconnoiter the area from which Washington was approaching. Mercer received word that Mawhood was leading his troops back across the bridge and back to Princeton. Mercer, on orders from Washington, moved his column to the right in order to hit the British before they could confront Washington’s main army. Mercer moved towards Mawhood’s rear but when he realized he would not be able to cut off Mawhood in time, he decided to join Sullivan. When Mawhood learned that Mercer was in his rear and moving to join Sullivan, Mawhood detached part of the 55th Regiment to join the 40th Regiment in the town and then moved the rest of the 55th, the 17th, fifty cavalry and two artillery pieces to attack Mercer. Mawhood ordered his light troops to delay Mercer, while he brought up the other detachments. Mercer was walking through William Clark’s orchard when the British light troops appeared. The British light troops’ volley went high which gave time for Mercer to wheel his troops around into battle line. Mercer’s troops advanced, pushing back the British light troops. The Americans took up a position behind a fence at the upper end of the orchard. However, Mawhood had brought up his troops and his artillery. The American gunners opened fire first and for about ten minutes, the outnumbered American infantry exchanged fire with the British. However, many of the Americans had rifles which took longer to load than muskets. Mawhood ordered a bayonet charge and because many of the Americans had rifles, which could not be equipped with bayonets, they were overrun. Both of the Americans’ cannons were captured, and the British turned them on the fleeing troops. Mercer was surrounded by British soldiers and they shouted at him “Surrender you damn rebel!”. Declining to ask for quarter, Mercer chose to resist instead. The British, thinking they had caught Washington, bayoneted him, and then left him for dead. Mercer’s second in command, Colonel John Haslet, was shot through the head and killed. Fifty light infantrymen were in pursuit of Mercer’s men when a fresh brigade of 1,100 militiamen under the command of Cadwalader appeared. Mawhood gathered his men who were all over the battlefield and put them into battle line formation. Meanwhile, Sullivan was at a standoff with the detachment of the 55th Regiment that had come to assist the 40th Regiment, neither daring to move towards the main battle for risk of exposing its flank. Cadwalader attempted to move his men into a battle line but they had no combat experience and did not know even the most basic military maneuvers. When his men reached the top of the hill and saw Mercer’s men fleeing from the British, most of the militia turned around and ran back down the hill. As Cadwalader’s men began to flee, the American guns opened fire onto the British, who were preparing to attack, and the guns were able to hold them off for several minutes. Cadwalader was able to get one company to fire a volley but it fled immediately afterwards. At this point, Washington arrived with the Virginia Continentals and Edward Hand’s riflemen. Washington ordered the riflemen and the Virginians to take up a position on the right hand side of the hill and then Washington quickly rode over to Cadwalader’s fleeing men. Washington shouted, “Parade with us my brave fellows! There is but a handful of the enemy and we shall have them directly!”. Cadwalader’s men formed into battle formation at Washington’s direction. When Daniel Hitchcock’s New England Continentals arrived, Washington sent them to the right, where he had put the riflemen and the Virginians. Washington, with his hat in his hand, rode forward and waved the Americans forward, while he rode ahead on his horse. At this point, Mawhood had moved his troops slightly to the left to get out of the range of the American artillery fire. Washington gave orders not to fire until he gave them the signal, and when they were thirty yards away, he turned around on his horse, facing his men and said “Halt!” and then “Fire!”. At this moment, the British also fired, obscuring the field in a cloud of smoke. 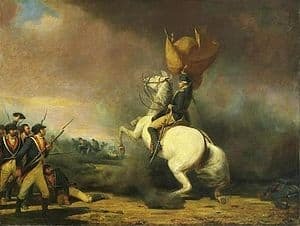 One of Washington’s officers, thinking he was dead, as he was in between both lines, exposed from fire on both sides, pulled his hat over his eyes, but when the smoke cleared, Washington appeared, unharmed, waving his men forward. On the right, Hitchcock’s New Englanders fired a volley and then advanced again, threatening to turn the British flank. The riflemen were slowly picking off British soldiers while the American artillery was firing grapeshot at the British lines. At this point, Hitchcock ordered his men to charge, and the British began to flee. The British attempted to save their artillery but the militia also charged, and Mawhood gave the order to retreat. The British fled towards the Post Road followed by the Americans and Washington, still angry from the foxhunt call from Harlem Heights, shouted “It’s a fine fox chase my boys!”. Some Americans had swarmed onto the Post Road in order to block to British retreat across the bridge, but Mawhood ordered a bayonet charge, and broke through the American lines, escaping across the bridge. Some of the Americans, Hand’s riflemen among them, continued to pursue the British, and Mawhood ordered his dragoons to buy them some time to retreat, however, the dragoons were pushed back. Some Americans continued to pursue the fleeing British until nightfall, killing some and taking some prisoner. After some time, Washington turned around and rode back to Princeton. At the edge of town, the 55th Regiment received orders from Mawhood to fall back and join the 40th Regiment in town. The 40th had taken up a position just outside of town, on the North side of a ravine. The 55th formed up to the left of the 40th. The 55th sent a platoon to flank the oncoming Americans, but it was cut to pieces. When Sullivan sent several regiments to scale the ravine, they fell back to a breastwork. After making a brief stand, the British fell back again, some leaving Princeton, and others taking up refuge in Nassau Hall. Alexander Hamilton brought some guns up and had them blast away at the building. Then some Americans rushed the front door, broke it down, and the British put a white flag outside one of the windows. The British walked out of the building and laid down their arms. After entering Princeton, the Americans began to loot the abandoned British supply wagons and the town itself. With news that Cornwallis was approaching, Washington knew he had to leave Princeton. Washington wanted to push onto New Brunswick and capture a British pay chest of 70,000 pounds but Major Generals Henry Knox and Nathanael Greene talked him out of it. Instead, Washington moved his army to Somerset Courthouse and in the following days, to Morristown, arriving on January 6, at 5:00 PM. After the battle, Cornwallis abandoned many of his posts in New Jersey, and ordered his army to retreat to New Brunswick. George Washington reported his own army’s casualties as 6 or 7 officers and 25 to 30 enlisted men killed, giving no figures for the wounded. Richard M. Ketchum states that the Americans had “30 enlisted men and 14 officers killed”; Henry B. Dawson gives 10 officers and 30 enlisted men killed; while Edward G. Lengel gives total casualties as 25 killed and 40 wounded. The Loyalist newspaper, New York Gazette and Weekly Mercury, reported on January 17, 1777, that the American losses at Princeton had been 400 killed and wounded. Eight current Army National Guard units (101st Eng Bn, 103rd Eng Bn, A/1-104th Cav, 111th Inf, 125th QM Co, 175th Inf, 181st Inf and 198th Sig Bn) and one currently-active Regular Army Artillery battalion (1-5th FA ) are derived from American units that participated in the Battle of Princeton. There are only thirty current units of the U.S. Army with colonial roots.